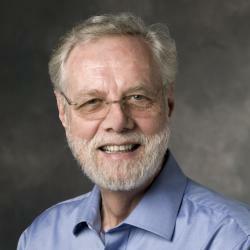 Ronald W. Davis, PhD, is director of the Stanford Genome Technology Center, professor of biochemistry and genetics at the Stanford School of Medicine and a member of BioX and the Stanford Cancer Institute. In 1980, Davis, together with David Botstein, AB ’63, PhD, described how sequence variants in the genomes of humans and other species could provide genetic markers for creating a genetic and physical map of the human genome. This finding helped launch the field of genomics. The groundbreaking biotechnologies Davis developed have played an indispensable role in advancing the fields of molecular genetics and genomics. Early in his career, Davis developed one of the first DNA mapping methods, as well as some of the earliest cloning vectors. While studying the genome and biology of Saccharomyces cerevisiae (baker’s yeast), he developed the first artificially constructed chromosomes, which are now used routinely for genetic analysis of yeast and other organisms. He also described the first case of what is now known as genome editing, the ability to replace any nucleotide in the yeast genome with any other nucleotide. A few years later, the Davis lab showed how DNA libraries could be searched with protein-finding antibodies, a technique that made it possible for scientists to identify genes for important proteins. He is currently developing nano-fabricated devices using direct electrical detection of DNA sequencing and biomolecule quantitation.